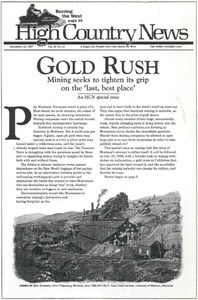 Special issue on hardrock mining: Montana has long had a love-hate relationship with hardrock mining, and the prospect of new massive gold mines is bringing all the problems to a boil. An introduction to HCN's special issue on mining in Montana shows the state at the center of debate on hardrock mining. Montana has long had a love-hate relationship with hardrock mining, and the prospect of new massive gold mines is bringing all the problems to a boil. The proposed McDonald Mine on the Blackfoot River would impact a landscape made mythic by anglers and Norman Maclean's "A River Runs Through It." McDonald mine owners, Canyon Resources, face problems related to spills, finances and falling gold prices. Montana writers collaborate on a book called "Headwaters," hoping to protect the Blackfoot River from a gold mine. The statistics of a huge gold mine like the proposed McDonald Mine are impressive, but the de facto city created will last only 10 to 20 years. The Garland family in Lincoln, Mont., illustrates Montana's love-hate relationship with mining, with Teresa Garland in favor of the McDonald Mine and her sister Becky strongly against it. In his own words, mining geologist KD Feeback defends the proposed McDonald Mine. In his own words, retired rancher Land Lindbergh warns against the damage the McDonald Mine would do to the Blackfoot. A time line describes the decline and fall of gold mining at Montana's Zortman-Landusky Mine. In his own words, former water-quality enforcer Kevin Keenan criticizes the state of Montana for its favoring of the mining industry. We are fools to throw away, for a snowmobile's adrenaline rush, the chance to really get close to nature, the writer believes. Local activists fight a mining giant when they battle the Zortman-Landusky gold mine on the edge of the Fort Belknap Indian Reservation. Romanian road rage in Mont. ; Idaho poachers spear chinook salmon; Wonder Bread recaptures roaming zoo buffalo; crows chase coyote in Seattle; goldfish surgery; escaping emu in Utah; beaver re-landscapes condominium; drinking and riding in Great Falls. Snowtime in the Rockies, skipped issue, corrections, Tucson board meeting, John McPhee recommends HCN. Can silver be mined safely from under a wilderness? Two companies want to mine the silver that lies underneath Montana's remote Cabinet Mountains Wilderness. In Congress, the 1872 Mining Law still rules despite attempts to change it, but some think there is hope in the future for reasonable reform. Activists seek to protect Yellowstone's bison from another slaughter by physically shepherding wandering bison back onto protected land. Rural Colorado's Gunnison County turns down $38 million to upgrade hihghways, saying the people would rather preserve their quality of life. Washington's Lummi Casino closes because of too much competition. Judge William Downes rules that the wolf reintroduction in Yellowstone and central Idaho was illegal and orders the animals to be removed. Activists try to end crop burning by farmers in eastern Washington and northern Idaho, saying the resulting air pollution is harming the health of area residents.